Many of our innkeepers have gone to great lengths to ensure that their businesses are green. They use cleaning products that are less harmful to the environment, and ecologically friendly soaps. They buy locally, using locally grown produce in their food whenever possible. They make many choices small and large to help lessen their impact on the environment, and they do so because they believe it is essential. Below is a list of green inns in Tennessee. Please peruse them to see if one is right for your next vacation in Tennessee. We endeavor to live responsibly from those things we recycle, the choices we make when buying products, to those herbs and vegetables we grow fresh on the property. Do we have this down to a science? Certainly not, but each year we contribute a little less to the carbon footprint we leave behind. We never miss an opportunity to reuse and recycle. Guests are provided with white paper sacks for collection of recyclable items (bottles, paper, etc.) Wall dispensers for shampoo and cream rinse do away with tiny bottles. Vegetable/fruit waste is composted. Low energy appliances and lighting are used often. Decorative lighting is being switched to LEDs. You may rehang your towels if you so choose. In the end, an historic building like our inn (built in 1889) is the ultimate recycling program. Remodeling choices have been "green" to the best of our ability at the time of their creation. We'd still love to install a tiny windmill to harness the frequent here in Northeast Tennessee. Rustic and romantic Gatlinburg bed and breakfast on the creek, outside of town, lots of hand made furnishings, close to hiking in the Great Smoky Mountains. Free trail map and picnic lunch to your favorite trail or waterfall. Mention this special! 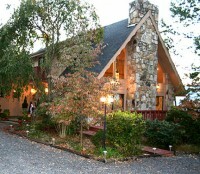 Hot tub suite or cabin for 2 nights, breakfasts on the porch or fireside...our food is as organic as we can find or grow! Many vegetarian options available as well. Two nights with hot tub starting at $418 plus tax!